The Transport Museum London main exhibition Floor is an open plan gallery which is divided into 6 separate area covering various aspects of Transport. Personally this was my favourite floor as it is where you get the best chance to climb and sit on different vehicles from the famous London Route Master to original underground trains. To reduce congestion on the surface more underground networks were needed to up the capacity and destination range, however advances in technology and engineering were needed before this could happen. Firstly a better method for digging the tunnels was needed. This came in the form of the development of cast iron shield which enables workers to safely dig tunnels through the ground. Secondly a better method to get passengers to and from the underground network was needed. escalators and lifts provided the solution to this. Lastly steam trains underground was not very practical and made travelling underground very unpleasant for all concerned. The invention of the electric train and system addressed this problem. One thing London's transport network has always been recognised for is its strong look and feel. Great design has helped encourage more people to use the transport system over the years and to make London transport a world recognised and respected Company. This gallery explores all of these design elements and more, from poster design to civic building architecture. The Transport museum London addresses the little train driver in all of us in this gallery by installing interactive units where you feel that you are actually driving a underground train yourself. 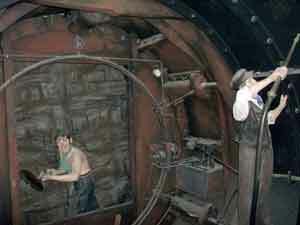 There is also a full sized underground train carriage from 1938 which has become the template for carriages ever since. You can go inside and sit down and see and hear a projection at one end of the carriage which gives the impression of the train moving along. This is a small section in the Transport Museum London but one which illustrates well how London's transport system played a vital role during both world wars. The gallery mainly consists of photographs and accounts of staff and how they did far more than they had to, to keep the system and people moving around the city. The underground stations were used during the second world war as air raid shelters for thousands of people and a temporary shelter can be seen in the gallery. 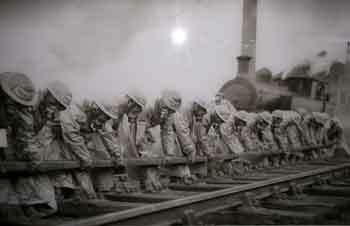 Despite this the trains continued to run for the whole of the duration of the war. During the war women began to work in traditionally male roles for the first time and had to take on duties which required both strength and courage. There are many pictures showing women in these new and very unfamiliar roles and getting on with it. The motorised vehicle began to replace all horse drawn carriages and public transport after 1900. This began with the first electric tram in 1901, which were replaced in 1938 with trolleybuses. This part of the gallery has several very wonderful examples of these two types of motorised vehicles which you can get on and explore for yourself. These vehicles were before my time but they seem so familiar to me as they were immortalised in many early advertising posters and old London films. I almost miss the old trams even though i never knew them. This has to be my favourite section of the transport museum London as it contains three generations of the route master .A bus which has become synonymous with London itself and which I grew up with. I loved the sound of the engine, the smell of the wood and oil and the comfort of having a conductor on board. Sadly our modern buses have lost all of this and now bus journeys don't seem to be do much fun anymore. The early route masters were very tall and narrow, later they filled out a bit and became a bit more squat in stature, these were the buses I knew and loved as a child. Sadly they were scrapped from service in the last decade but due to public demand a new proto type based on the route master design has been commissioned and which can be seen next to the original buses. Hope you enjoy your visit to the Transport Museum London.